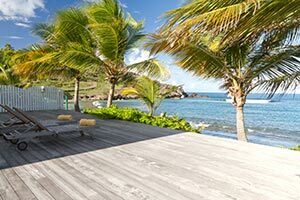 Villa UJV 305, also referred to as Les Sables, is a private beachfront villa in Lorient, St Barts, with separate bungalows set back from the road; each bungalow has a kitchenette (in addition to the main kitchen). The location affords great breezes. There is abundant pool furniture and a gas grill. This is the perfect villa for families. The bedrooms are similar in size. The living room is in a separate bungalow, and opens to a terrace on each side; one in front of the beach and the other on the deck around the pool. There is a path to the beach and villa is located at the far western end of Lorient Beach. Villa UJV 305 comfortably accommodates four guests.